Anzhelika Izrailova, a medical assistant at NYU-Langone Levit Medical, says her wages and benefits increased since the clinic was purchased by NYU and workers there joined the union. About 70,000 New York City area nurses and other health-care workers are poised to authorize a one-day strike that would take place July 31. Negotiations over a new contract happen every three to four years, but now both union and hospital leaders are grappling with a new issue: an industrywide shift away from hospitals toward outpatient clinics. A committee representing the city’s health-care unions voted to authorize the strike last week, and union leaders say early returns from a separate vote by members shows more than 90% would strike. A final tally won’t be available until Wednesday. A strike could be averted if a deal can be reached by an extended deadline of July 30 or if they further extend the deadline for negotiations. It would be the first time that this group of critical hospital and clinic workers have walked off the job in at least two decades. One reason for the job action, labor officials said, was to send a message that they want to keep the city’s health-care industry unionized. Officials with 1199 SEIU United Healthcare Workers East say they are losing their grip on the industry as employment shifts away from hospitals, with a heavily unionized workforce, toward outpatient clinics, where employees are primarily not unionized. They want hospitals to agree not to prevent workers from forming unions and to have a process in place to unionize workers at these clinics. Union leaders say that workers at these nonunion outpatient facilities receive lower salaries and pay significantly more for health-care benefits than unionized workers at hospitals, who have no premiums or copayments. Since 2004, New York state’s outpatient workforce increased 24%, compared with a 7% increase in hospital employment, according to the U.S. Department of Labor. Nationally, outpatient employment has increased 46% since 2004, compared with 11% for hospitals. Unionized health-care workers make median weekly wages of $837, which is 14% higher than their nonunion counterparts, according to the coalition of unions. Hospital representatives said allowing a unionized workforce at the clinics they are building is a complicated issue. They said they need to compete with clinics that aren’t affiliated with hospitals and don’t employ union workers. And they said that in some cases even if their clinics don’t pay union wages, they are still better than many clinics not affiliated with hospitals. Shifting health-care away from emergency departments and hospital wards is a crucial cost-saving measure envisioned by both the Affordable Care Act and a recent infusion of $8 billion in Medicaid funds to New York that has the goal of reducing unnecessary hospitalizations by 25% over the next five years. One way many clinics save money is by keeping labor costs down. Another issue in the dispute is the structure of a benefit fund that hospitals pay into, which union officials said would result in benefit cuts for low-wage workers. Mr. McIver said he would present a proposal in the coming days to address those concerns. 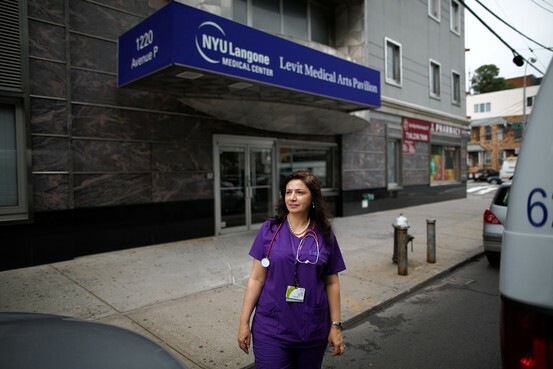 Anzhelika Izrailova, a 51-year-old medical assistant at NYU Langone Levit Medical, a group practice in Brooklyn, said she earns $3 an hour more since the clinic was purchased by NYU in September and workers there joined the union. When she started working at the clinic nine years ago she paid several hundred dollars a month in premiums, which nearly doubled several years ago. Now as part of the union she pays no health-care premiums.